Creating a long term SEO strategy for affiliate sites should be no different than it is for an ecommerce site, or any other online business. To maximise any SEO work, it’s obvious that the SEO team should work hand in hand with the affiliate team in order to make sure that selected target pages and terms are going to stand the best chance of delivering an increase in revenue. It’s easy to coordinate when working with a ‘one-man show’ or small organisation, but can get a little tricky and time consuming when working with a larger business. I thought I’d explore how this bridge might be gapped, and also look into a few things that need to be done once you’ve selected the best pages and keywords to work on. It still amazes me that this simple point of working on prioritising the best revenue generating pages can often be missed, with the SEOs doing ‘SEO’ and everyone else getting on with their own mission independently. Picking out good target pages for SEO should not always be 100% about search volume; you really need to get to the core of the business if you want to be as effective as possible. 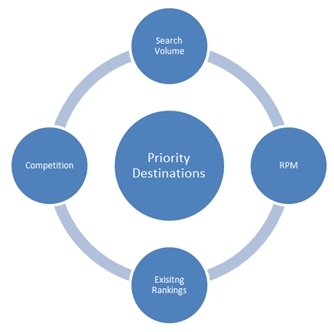 For this post we’re going to imagine that we’ve been tasked with selecting a list of priority destinations for a travel affiliate site– and coming up with a high level plan to start improving revenue via organic search. The more of the data points above we can use in our decision making process, the better the eventual outcome will be for everyone. Sticking with the travel example, let’s say our keyword research has led us to creating destination guides to attract traffic looking for ‘things to do in [destination]’. As such, we really need to know which destinations are likely to bring in the largest volumes of traffic, but at the same time will also be able to generate a substantial increase in revenue. To do this, I’ve started by creating a simple spreadsheet to match the page, associated keyword, search volume and current ranking position. This initial comparison will help you to identify any quick wins or future gold when it comes to search volume and your sites existing position in the SERPS. I’ve also left a column free for EPV (earnings per visitor calculated at a page level if possible) so you can start to look at the revenue potential of increasing traffic to a certain page. The reason I’ve chosen EPV as a figure is because total earnings will obviously be dependent on traffic, and at this stage we’re looking for revenue potential. The figure you use here will depend on your business model; breaking this down to a page level will definitely be a challenge for some sites and it might be a better fit to use commission levels or CTR. Whatever you decide to use, the goal is to find a number that clearly tells you which pages are likely to be your most valuable. With the example above, ‘things to do in Paris’ looks like a really good choice because the search volume is high and the site in question is already ranking in position 18. However, it might be the case that for such a competitive keyword your budget won’t reap any rewards for a significant amount of time. Speaking to the affiliate might reveal that revenue generated from the Geneva page is actually far greater, which would be a huge bonus as the site is already in 11th. In terms of a travel site and attracting traffic to destination guide style content, you may well find that people visiting Paris tend to spend more on average than people visiting Berlin. 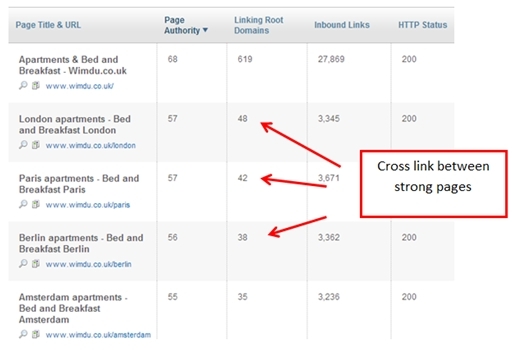 Link building and increasing search traffic is tough, so you need to make sure you understand these differences before you get started. If you’re starting out from scratch and have no revenue data to measure this on, setting up a test PPC campaign as a data gathering exercise would be a very clever thing to do. Once you’ve checked out your options and decided on a set of keywords that you feel confident will deliver an increase in revenue; you’re obviously going to need to check against the competition to make sure a good result is achievable. If you’re working on a set number of pages, your link building budget is probably going to be one of your biggest expenses – so don’t waste it chasing after unattainable dreams! 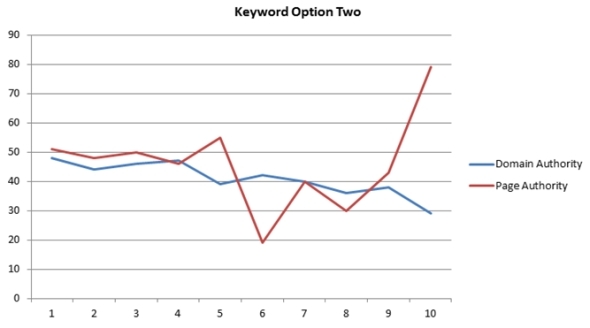 This in itself should play a big part in your decision as to which page and set of keywords to target. Using the travel site example, it’s likely to be harder to rank for ‘things to do in London’ compared to ‘things to do in Bruges’. As such, you might want to match up competition levels with your budget and try to pick a battle that is realistically achievable. The charts above show that targeting ‘option two’ is going to be easier and less competitive than targeting option one. In real life terms this will probably mean less link building is required to start gaining a better position and increasing revenue through your target page. The ideal situation is to find that ‘sweet spot’ where you stand a chance of competing, but where there’s also enough search volume to make the exercise worthwhile. Now comes the hard part! Once you’ve decided on your list of priority pages to target, you’ve got to start figuring out how to get more traffic via organic search. So how many pages should you be prioritising? If your budget is going to be a little tight, then it would probably be wise to think about selecting 2 – 3 priority pages to start with. Building links and seeing rankings increase definitely takes time, and if time is a problem you definitely don’t want to be spreading yourself too thin. Of course, once you start to see some movement you can start to spread out a little and target other destinations – or alternatively shift your time to pages that start to gain momentum and really take off. It goes without saying really, but it’s vitally important that there’s some good quality content in place. Selecting a page to target that has little or no content on means you’ll be starting on the back foot – not good. At this stage I’d also start to carry out some simple checks for duplicate content both internally and externally. I wouldn’t really go beyond picking a snippet of text and searching for it in quotes; all I’m looking for is an indication of whether or not I require a re-write due to duplicate content issues. If I do need some content, then it’s a pretty simple thing to get sorted, and much better I do this at the start. Are there any other pages targeting my term? Is my page linked to internally? Is my URL in the XML sitemap? Does my URL suffer from any canonical issues? Is the page set to index,follow (you’d be surprised)? Really, picking the best pages to target is a combination of factors that need to line up – don’t waste time building traffic to pages that don’t earn enough money to justify the effort! Have something to say about this article? Comment above, share it with the author JonQuinton1 or directly on Facebook, Twitter or our LinkedIn Group.